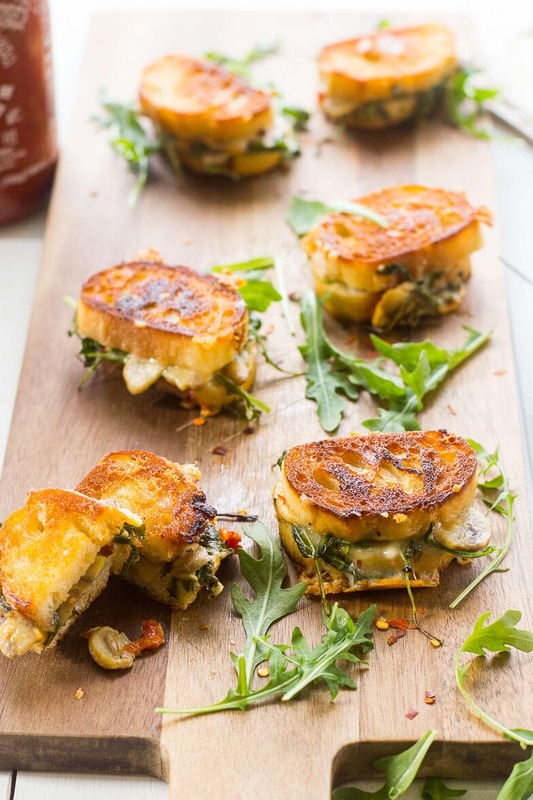 These Mini Grilled Cheese Sandwich Appetizers made with aged cheddar, sundried tomatoes, mushrooms and arugula are perfect for easy summer entertaining! Now that the backyard patio is open, I'm so excited to start entertaining this summer. As I grow older, I find I'm growing out of partying and going to clubs (don't get me wrong I still go dance my tail off a couple times a year!) and I'm valuing entertaining more at home. I mean, the booze is free, the food is good…I sometimes don't like the mess but I like being able to act as my own DJ and pick the dinner menu. I also find that I'm better able to really connect with friends and family more at home – it's just a comfortable, welcoming space where everyone can relax and enjoy themselves. 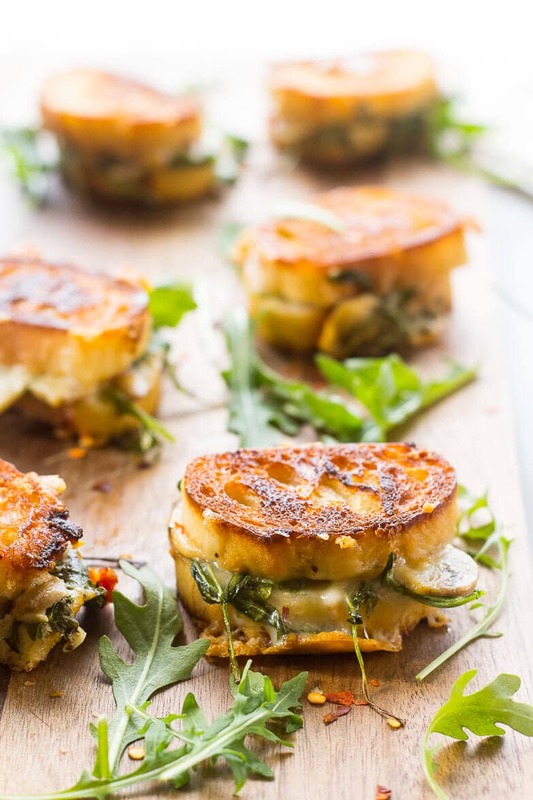 Well, speaking of summer entertaining, these Mini Grilled Cheese Sandwich Appetizers are just what you need for your next party. They're cute and handheld, they're customizable and they are absolutely delicious! What more excuse do you need to up and make these this weekend? I'm so excited that I'm almost done my thesis because I will finally be able to start doing videos on my blog – this is one of those recipes I wish I had had time to do a video for because grilled cheeses are something everybody loves and I personally believe they are an underrated appetizer. I recently attended a friend's birthday party in Toronto in the Distillery District, and of all things they were serving mini grilled cheeses with this mind-blowing aged cheddar and sriracha ketchup – such an obvious idea to serve such a crowd-pleasing classic, and they were wolfed down in seconds. Needless to say, I was inspired to make my own with just a few more toppings! 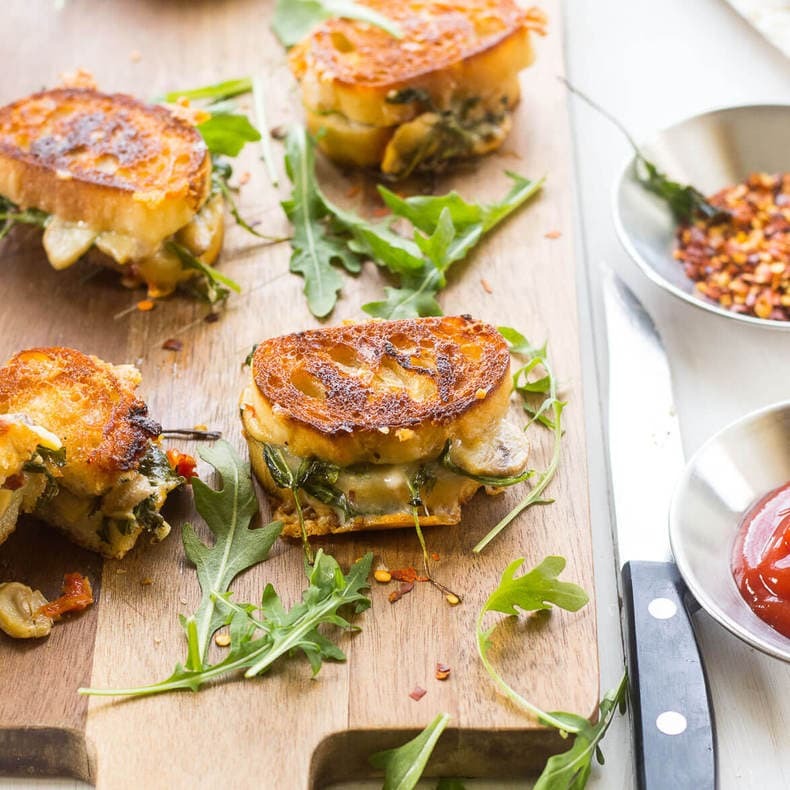 If I were to remake these Mini Grilled Cheese Sandwich Appetizers, I would definitely create an open bar concept for guests to customize their grilled cheeses – think toppings like pesto, bacon, caramelized onions, etc. You can also set out different kinds of cheese, like applewood smoked cheddar, blue cheese, buffalo mozzarella, brie, Swiss and more. I absolutely love this grilled cheese bar idea on Oh Happy Day – this website is SUCH an amazing resource for party ideas and they've even got free printables for people looking to customize their own. 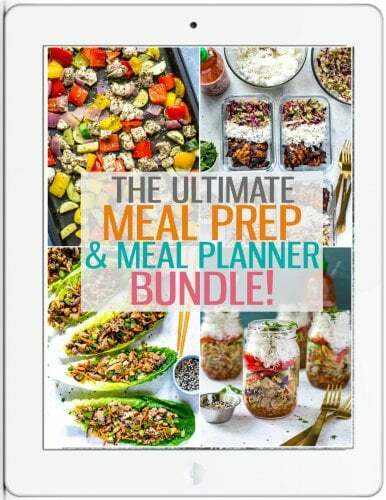 I highly recommend you check it out if you've got a special occasion coming up! If you're not feeling the party idea of course, you can always set up a signature sandwich like I have done and pair them with a bunch of other different kinds of appetizers such as these cute Open Faced Samosa Bites or Party-Friendly Mini Pizza Bites. 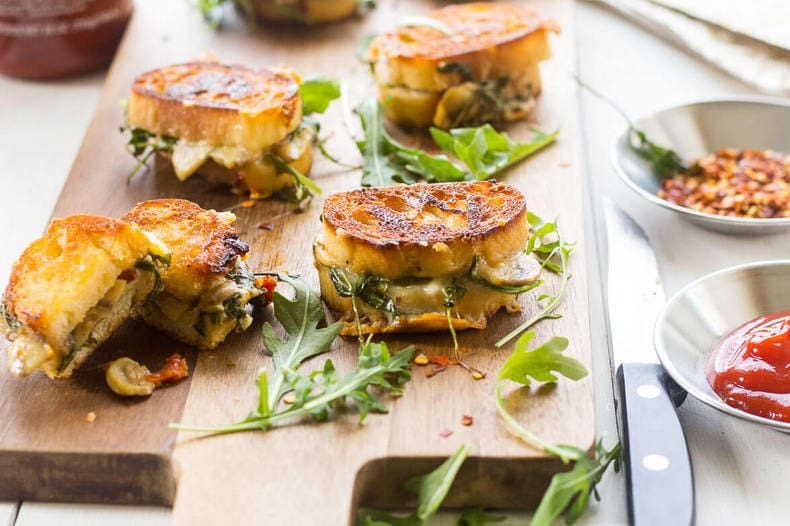 Appetizers just really make me excited about summer: you get a bunch of drinks and small bites together for all the BBQs, campouts, cottage weekends and beach days…there are just so many great opportunities for full days of eating and boozing, it's fantastic! In honour of the warmer weather, I've also set up a Summer Entertaining Ideas board on Pinterest that I would love you all to be apart of! 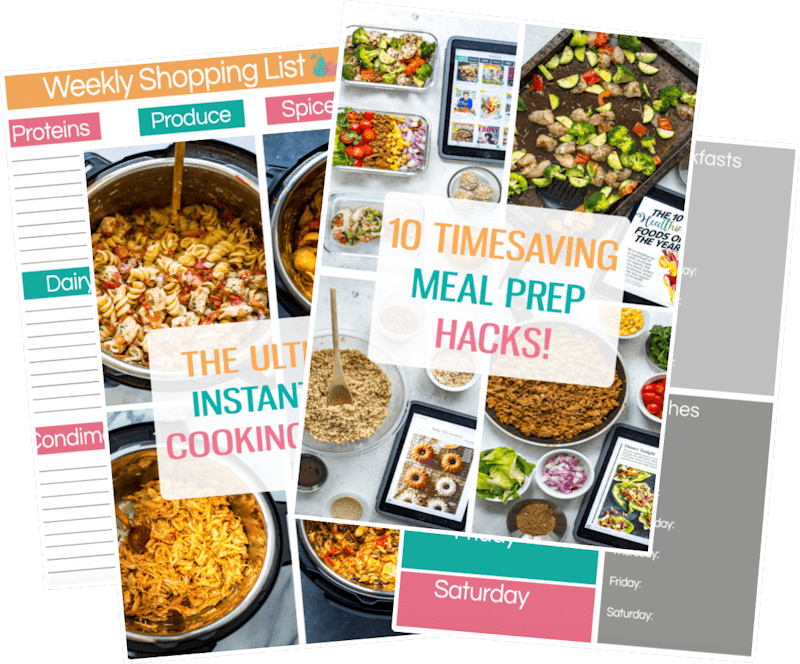 If you're looking for some cool ideas for your next gathering – from home decor to food and DIYs, go check it out and get in the spirit of one of my favourite seasons! 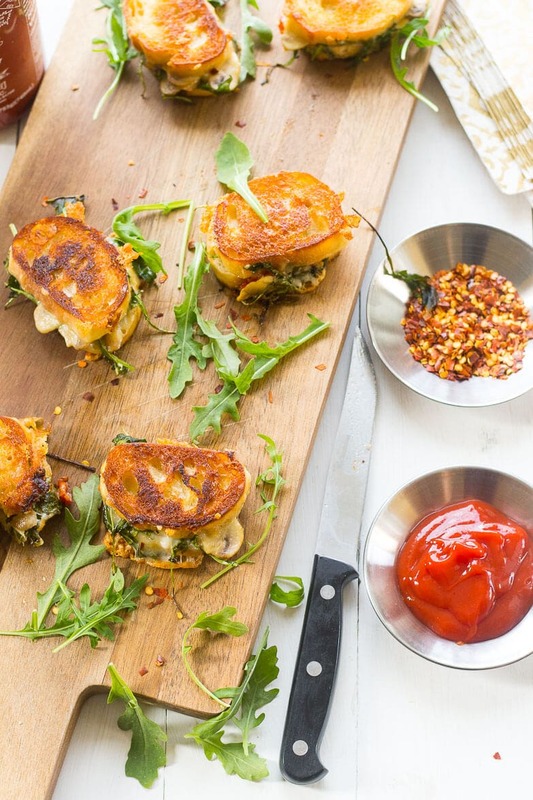 Will you be trying these Mini Grilled Cheese Sandwich Appetizers? If you try any of my recipes be sure to let me know in the comments, on Instagram, Twitter or Facebook! I'd love to hear from you and talk all things summer! 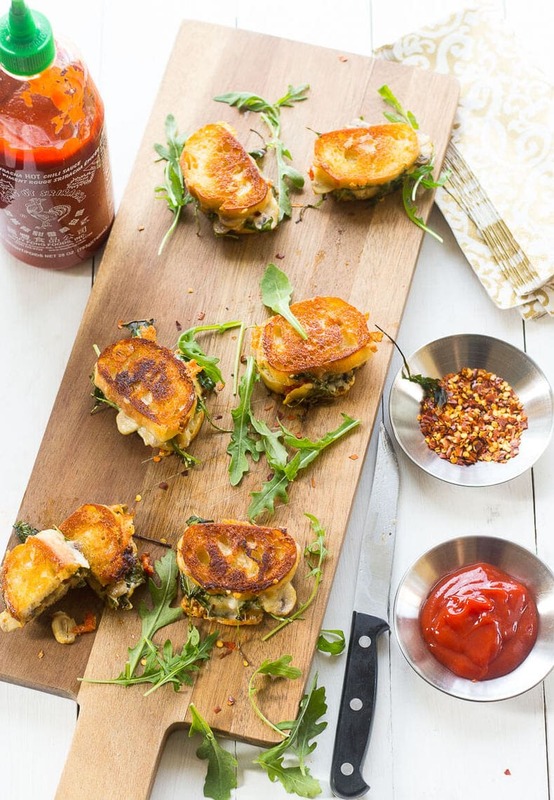 These Mini Grilled Cheese Sandwich Appetizers are perfect for summer entertaining, and they are easy to whip up for a crowd! Sauce mushrooms in a frying pan over med-high heat. Slice sundried tomatoes and prepare other toppings in the meantime. 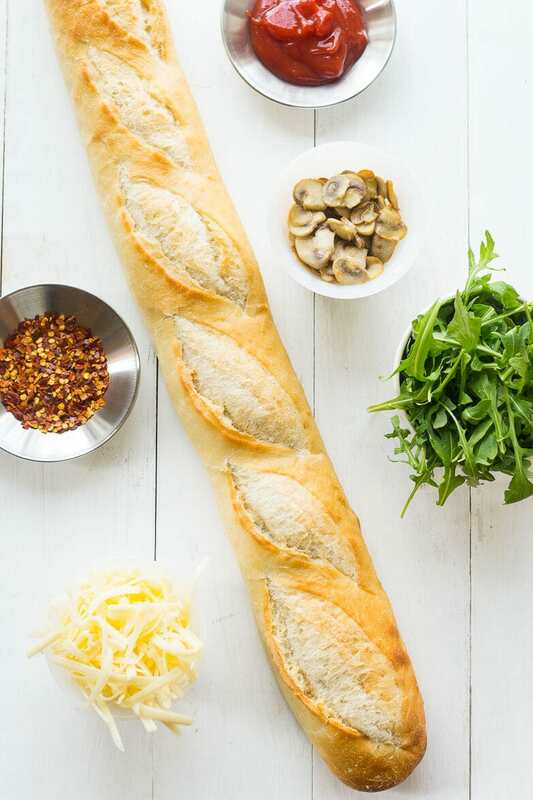 Slice baguette relatively thinly, then top with cheese, mushrooms, sundried tomatoes, arugula and fresh basil. Sprinkle with a pinch of red chili flakes, some black pepper and sea salt. Cook sandwiches in batches of 5 or 6 in a large frying pan on med-low heat, melting 1-2 tbsp of butter at a time. 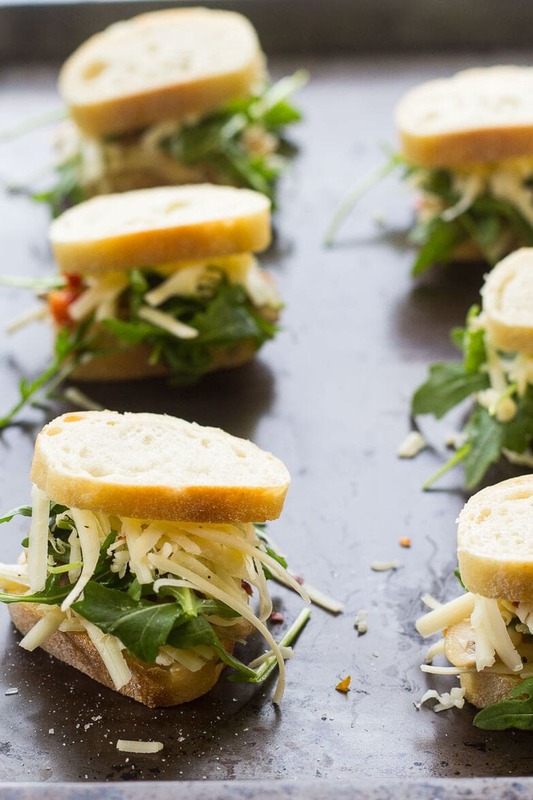 Cook for about 3-4 minutes each side until cheese starts to melt and the outside of the sandwiches gets crispy. 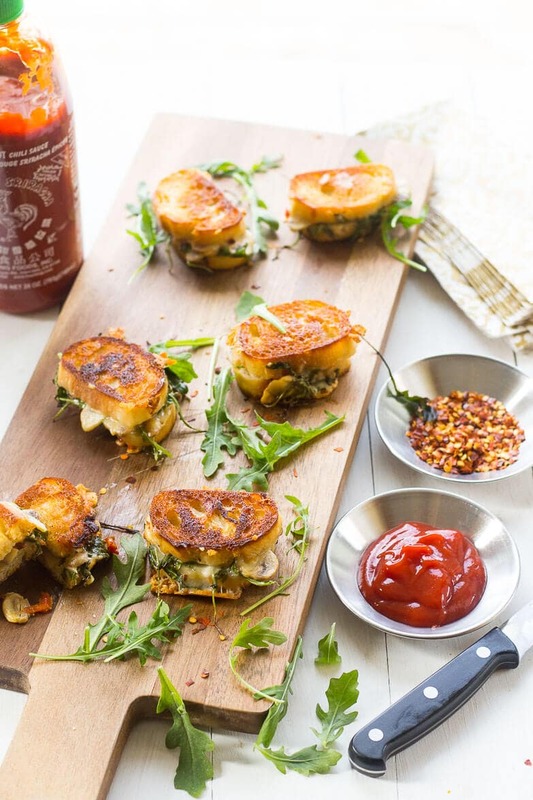 Serve immediately with ketchup and sriracha - enjoy! OMG. These are beyond drool-worthy! I was wishing I could reach through my screen to grab one. I’ve got to try these. Well these are just adorable! Mini things are the best! Thanks for sharing! I have a question! It says serve immediately…Does the bread get too hard after a bit? I want to make these for a house warming party, but I would be cooking them at home and then bringing them over.